If you use business-to-business direct mail, you know how hard it is to get your mail in front of your prospect. It’s often intercepted in the mailroom or thrown away by your prospect’s assistant. Either way, your prospect never sees it. Fortunately, there’s a direct mail format that usually breezes through those obstacles to land squarely on your prospect’s desk. It’s called three-dimensional (3-D) mail. And it’s mail that appears to be so important and valuable that the gatekeepers don’t dare throw it away. Better yet, even jaded executives are tempted to open it. The secret to 3-D mail is the use of oversized or odd-sized packages that have the appearance of a gift. For example, you can use an odd-sized envelope, tube or wooden box. And it’s a good idea to send the package by Federal Express or UPS, to emphasize its importance. The package itself contains an item designed to further pique your prospect’s interest. The mailing might contain a jigsaw puzzle with missing pieces. Or a lock with an offer to deliver the key. Or a bag of shredded money. Or any of a thousand other options. An odd-sized package like this is far more likely to be delivered and opened than traditional direct mail. And that means you’re likely to get results that are off the charts. In fact, you can expect a response rate that’s 5 to 50 times the normal rate. Let me give you a quick example. IPRO Tech is a company that creates software for top corporate attorneys. It needed to drive traffic to a booth at an industry conference. A 3-D mailing was the perfect solution. One week before the trade show, our prospects received a package via FedEx containing a money maze with a dollar bill trapped inside. Prospects had to solve the maze to retrieve the dollar. The maze was accompanied by a letter revealing some of the extraordinary benefits of IPRO’s software. The letter also revealed that the solution to the maze could be found by talking to IPRO’s representative. With a 3.1% response rate, the IPRO team came to a profitable conclusion: The sale of just one software program would more than quadruple the campaign’s ROI. 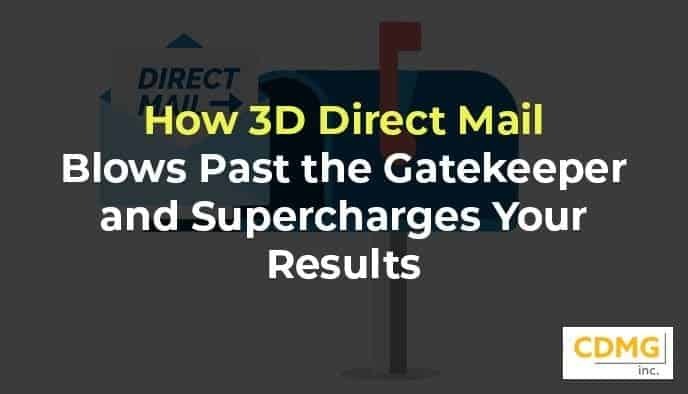 Your company can also experience this kind of lead-generation success with 3-D direct mail and other formats. Call (310) 212-5727 or email caleb@cdmginc.com now for a free, no-obligation consultation. Ask how we can help you increase your leads, sales and profits.